We know there have been questions about the queues on the servers, so we wanted to take a moment to give you some insight. In order to ensure that the service would be smooth and stable, we staged how we brought people into the Early Game Access program, adding people in waves. As you know, there are a lot of folks who want to play the game right now and we want to make sure they have lots of people to play with. Balancing this with figuring out when to bring new servers online to help alleviate the size of the queues is part art and part science. On one hand, you do not want people to wait too long – on the other hand, you want to make sure that people have a dynamic, engaging community to play with for long after launch. Either way, we have one clear objective – to make sure folks have fun. think if we give them time it all pan out sorted in the end. As it is right now some servers are full while others are only marked as "light". I think we will need to wait a little for it to even out. It's mad this morning I've been in a queue since 9:30am GMT...and still 69 (wa-hey) to go. I'd rather they do a quick offer to move guilds and people to a different server to balance things out. If it doesn't settle down...I'm hoping that what they'll do. I think it's official...they did place us on the busiest server! Don't complain too hard. After a year or so of SWG I would have been happier to have been on the busiest server. "Unless you are prepared to queue to play." BioWare has warned Star Wars: The Old Republic players against creating characters on high population servers - unless you're prepared to queue to play. Some SWTOR servers are reaching their absolute population cap, senior online community manager Stephen Reid wrote on the SWTOR forum. Players have reported waits of up to two hours to play the game. This, Reid said, is to be expected, and will continue on some servers. "As many of you know, we're experiencing high load and corresponding queues on some servers," Reid said. "This is to be expected during launch, as a high number of people want to play the game, and for long stretches at a time. "We're monitoring all of our servers around the clock, and we're raising server population caps where required. However, to ensure our long-term goals of server stability and healthy populations, we do not want to raise population caps too rapidly. We want incoming players to populate lower population servers. At the same time, higher population servers will not be 'locked' because we want to allow people to join a server to play with their friends if they wish to. "With this in mind, we wanted to notify everyone of some consistently high population servers. These servers are closing in on their absolute population cap (the maximum amount of players who can be on the server at any given time) and will likely have a queue to enter even at off-peak play times. "We strongly advise you to not create new characters on these servers, unless you are prepared to queue to play." Reid published the servers that are reaching their population cap. They are reproduced below. "Many of you who are already playing on these servers are asking for solutions, and we understand your frustration," Reid continued. "At this time we can only ask for your patience. Population caps are being gradually raised on these servers, but raising them too fast will create an influx of new players and perpetuate the problem. We do not expect the queues to alleviate on these servers for the foreseeable future. If you do not want to queue, you should consider playing on another server, many of which have very low or no queues. "Character transfer is a common request for these servers. The ability to transfer your characters is being worked on, but there is no ETA on when it will be available. "Finally, we are also aware of the issues some have experienced where they have been disconnected during a queue due to internet issues, and had to restart their queue once more. This is a high priority for our server team and we'll be deploying a fix as soon as possible." "We do not expect the queues to alleviate on these servers for the foreseeable future. If you do not want to queue, you should consider playing on another server, many of which have very low or no queues." They brought about 10 more EU-English servers online yesterday or the day before. 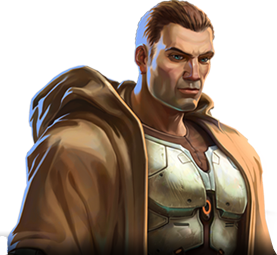 "Hey folks, as you may likely have seen in the last 24 hours, we've been redoubling our efforts in optimally managing the time it takes to get into Star Wars™: The Old Republic™. The BioWare Live Team has been carefully watching the influx of players into the game and is addressing with surgical precision the longer wait times on the small number of servers that were having longer wait times previously. We've also being doing our best to get every little bit of possible performance on our servers to increase capacity: we’ve “turned them up to 11” to do our very best to get you in and playing as quickly as possible. As a result - you should now be seeing significant improvement versus waiting times at the end of last week. We're also addressing the concerns about losing your place in line if you happen to disconnect for some reason before getting into the game. We've been working very hard on this and are performing final testing on potential solutions. Thanks for your patience and we really appreciate your enthusiasm for Star Wars: The Old Republic. We’re absolutely dedicated to ensuring you have a great experience both inside and outside the game.